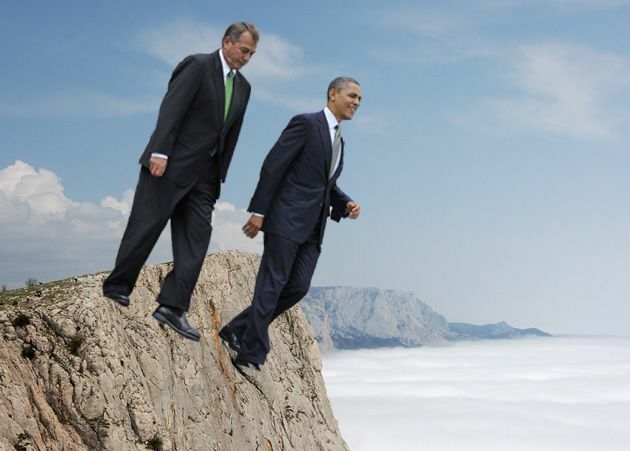 For several months now the mainstream media, political leaders and business commentators have focused on the “Fiscal Cliff” in the United States. President Barrack Obama and the Republicans in the U.S. Congress have been at loggerheads over how to deal with the very large federal budget deficits of the past five years. Another interim agreement was reached last night, and the stock markets have responded positively. But it is easy to discover that nothing has really changed. The U.S. politicians have bought two months of peace; by the end of February they will once again have to face the reality of the enormous budget deficit and the fact that the United States Congress has legislated an upper limit to the debt that the federal government may undertake. The debt ceiling of $16.4 trillion was reached on New Year’s eve. How can we make sense out of this economic and financial mess? It is difficult in that mainstream economists are committed to abstract models of the free market, focus on the current situation, and ignore the patterns of history. The mass media, owned and controlled by very large corporations, reflects this free market political perspective. We can gain some insight into the current crisis by looking at key fundamentals which are deemed important by political economists. For those of us outside mainstream economics, they provide a basis for understanding what is currently happening. (1) The advanced industrialized capitalist centres (often called The Triad of Japan, the European Union and the United States) are in a prolonged state of economic stagnation. From the 1960s through the period 2000-12, they have all experienced a steady decline in the rate of economic growth, increasing levels of unemployment and underemployment, and financial instability. The data on this is very clear. If in doubt, look at the World Bank figures. (2) Manufacturing has steadily declined in all three centres, with transnational corporations shifting their manufacturing to low wage countries. Profits for these corporations have increased significantly as labour costs were radically cut. They now have a “surplus” of capital with limited options for investments which would earn an acceptable return. On a world wide basis, there is excess capacity in most manufacturing sectors. (3) With the steady decline in manufacturing, the three centres have all seen a significant rise in the share of their gross domestic product in the Finance, Insurance and Real Estate (FIRE) sector of the economy. But this sector does not create the same level of employment as the manufacturing sector, nor the same general level of income for workers. (4) Various Keynesian fiscal and monetary policies have been implemented by governments and central banks to try to offset the stagnation of the private sector of the economy. Governments have borrowed heavily in order to increase government spending, including social services. Industrial developments are subsidized. The U.S. government is now spending $700 billion per year on the military. All of the Triad have greatly increased government debt. Since 2007, central banks have heavily subsidized the private finance industry. (5) With the collapse of the high tech bubble in 2000-1, central bankers began to panic. In the United States, the Federal Reserve, under Allan Greenspan, began pouring money into the housing market. Mortgage rules were liberalized in order to encourage renters to buy houses. It was hoped that the construction industry would replace the failed dot.com industry as the new source of economic growth. But new speculative bubbles arose in the housing and finance sectors. These began to rapidly deflate in 2007, resulting in The Great Recession. (6) The other major stimulus to the economy has been the expansion of personal debt. Home mortgages, home equity loans, student loans, and credit card debt have balooned since the 1980s, and more dramatically since the financial crisis of 2001. In the USA, household debt rose from 50% of GDP in 1980 to 98% in 2007. The world of money has been focused on the United States in recent months. The United States remains the largest world economy, and what happens on Wall Street has repercussions all around the world. There is a Fiscal Cliff, but it is the legislated debt ceiling of $16.4 trillion, which was reached on New Year’s Eve. The U.S. government must make another arrangement on the debt ceiling by the end of February. President Barrack Obama and the Republicans in Congress reached an interim agreement on the budget on January 1, 2013. It is estimated that the tax increases will provide the federal government with another $620 million in revenues. The cuts in social programs and military spending ($110 billion) would become automatic in two months. (1) Between 2009 and through 2012 the U.S. federal government has run budget deficits totaling $5.1 trillion dollars. QE-3 (September 2012 - present) - buying $85 billion in bonds and mortgage backed securities per month, a policy pledged to last until the official unemployment rate falls below 6.5%. Canadians are especially concerned about the state of the U.S. economy. We remain closely integrated with our southern neighbour in every way. We are heavily dependent on trade with the USA. American corporations are very dominant in this country. The value of the Canadian dollar is tied to developments in the United States. The free trade agreements with the United States are major obstacles to any Canadian government which would like to adopt independent economic strategies. Right now we are all hoping that the policies adopted by President Obama, the Congress and the Federal Reserve will help and not hinder the fragile economic recovery. John W. Warnock is retired from teaching political economy and sociology at the University of Regina. He is author of Saskatchewan: The Roots of Discontent and Protest.